You've got your new video games, your new console, now all you need is a fancy TV to go with it. 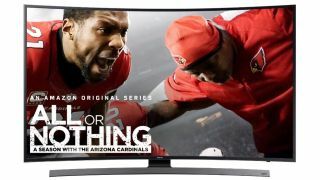 Lucky you, Amazon is not only cutting $300 off the price of this curved 55" 4K UHDTV from Samsung, it's throwing in a $100 gift card as well. View deal: 55" Samsung curved 4K UHDTV with HDR and a $100 gift card for $747.99 from Amazon. While not as big or fancy as some of the TVs we've seen, this one fits into a nice range of quality vs. price balance. Plus, the $100 gift card means you can turn around and save even more money on another deal. It's like deal-ception. Speaking of which, be sure to check out the rest of our constantly updated Cyber Monday gaming deals. And if you want to check out more TVs and home theater hardware, come take a peek at our Cyber Monday entertainment deals.